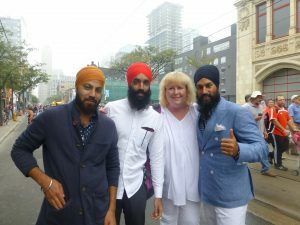 Since his recent election, Federal New Democratic Party (NDP) leader Jagmeet Singh has been asked in mainstream platforms to voice his opinion about the Air India Bombings of 1985. Even though he had nothing to do with the event that occurred more than thirty years ago, these questions are being asked simply because of his Sikh identity. We do not demand such accountability from white politicians. Little has been written about those who seek to demean Singh. It may astonish many that some of Singh’s fiercest critics are other South Asian figures. Bearing this in mind, it is important to emphasize the growing alliance between the Hindu Nationalist diaspora in North America and their alignment with controversial White Nationalists (including with the President of the United States, Donald Trump) under masquerading discourses of secularism and model minority aspirations. This is especially pertinent for historians working on topics of race, citizenship, and the politics of belonging. It is our responsibility to unpack complicated trajectories of migration and ethnicity, and how they impact multiple groups with intelligent empathy. This includes second and third generation children of right-wing Hindu immigrants and what attracts them to these problematic politics. Moreover, the presence of right-wing diasporic forces within Canada should no longer be underestimated given the connected global arena we occupy. One such organization that has increasingly made itself visible is “Rise Canada” and its proponent Ron Bannerjee. Banerjee has been at the forefront of Islamophobic protests in the Peele School District in Mississauga, campaigning not just against Muslim prayer spaces in schools, but also spurring the destruction of the Qu’ran in the name of “free speech”. For scholars and observers of what is commonly dubbed as “long distance Hindu Nationalism,” it is not a surprise that Banerjee heads not just “Rise Canada,” but also “Canadian Hindu Advocacy.” The website of “Rise Canada” claims that it advocates for “Canadian Values” that are apparently at “conflict with Islamic ways of thinking.” In a not particularly dissimilar vein of associating Islam and non-Hindu faiths of India such as Sikhism with terrorism and anti-secularism, the website for “Canadian Hindu Advocacy” states, “This organization has promoted Hindu interests and values, as well as organized rallies and events against Islamic and Khalistan Sikh terrorism.” This is a rather ironic stance for an organization that is known to be sympathetic to racist white supremacist and right-wing Zionist organizations in Canada, besides supporting Rashtriya Swayam Sevak (RSS) of India – a notorious organization known for campaigning (and at times committing) anti-Muslim and anti-Sikh genocides. The RSS has been banned thrice by the Indian government: first in 1948 when a former RSS member assassinated Mahatma Gandhi; then between 1975–77, during the “Emergency” under the controversial Indian Prime Minister Indira Gandhi, which further strengthened the organization’s base; and for a third time after the demolition of Babri Mosque in 1992 that also led to anti-Muslim riots and persecution in Ayodhya, Uttar Pradesh. It is important to note here that Hindu Nationalism is not Hinduism as a faith, but an ideology that seeks to assert the already dominant position of (mostly upper caste) Hindus in India through the persecution of non-Hindu and Dalit minorities in India, and by positioning themselves in a more favourable light relative to non-Hindu minorities in the West. While at the first glance there may be few similarities between Hindu Nationalism and White Supremacy, the current political climate has drawn them together in fascinating ways. Hindutva organizations in North America have often been clandestine about their right wing agenda. They coalesce under the umbrella of Sang Parivar, literally meaning joint family. Although still difficult to determine the scope of Canadian funding, an investigation by the South Asian Human Rights organization, AWAAZ (Awaaz means ‘voice’ in Hindi and Urdu) in Britain exposed how ‘Sewa UK’ (there is a branch of it called “Sewa Canada” here), used approximately $1.9 million to build Hindu nationalist schools in the province of Gujarat – the home province of present divisive Hindu Nationalist Prime Minister of India, Narendra Modi. In 2002, by the Prime Minister’s own party’s estimate, anti-Muslim genocide led to the deaths of over one thousand Muslims in the state. Carrying over these anti-Muslim prejudices from India to Canada, it should not surprise anyone that Banerjee exhibits the hatred he does for Muslims in his Islamophobic speeches. It is the logical end of a trajectory of demonizing Muslim minorities in India and transposing that demonization to the Canadian context. Even the emblem for the website of Rise Canada has a maple leaf emerging from the Hindu Nationalist symbol of a saffron lotus! Earlier this year he met other like-minded right-wing ideologues such as conservative M.P. Kelly Leitch. Non-Hindu minorities of India, be it Sikhs or Muslims, who challenge these perceptions are often silenced by claims of “Hindu victimization” – a phenomenon, as noted by historian Christopher Jaffrelot, that is based more in political rhetoric than fact . After the 1984 riots that led to the genocide and rapes of thousands of Sikhs in the capital city of Delhi, much evidence has surfaced about the involvement of both so-called “secular” members of the Congress Party in India and active involvement of Hindu Nationalists figures with affiliation to the RSS and BJP. It is indeed astounding to witness Rise Canada demand Singh condemn the Sikh ethno nationalist project of Khalistan Movement, for merely being a Sikh man. Singh is a Canadian who grew up in Windsor, Ontario in a Punjabi family. It reeks of hypocrisy to demand his opinion about the Air India attack while Rise Canada itself remains silent about their own sympathy with Hindu extremist organizations. Hypocrisy aside, the right-wing Hindu diaspora are often as deeply entrenched in racist portrayal of their self-histories as their White supremacist counterparts. Even today, many upper caste Hindus claim to be the original “Aryans.” When Ron Banerjee claims that he is “superior because he is Hindu”, his position as a Bengali-origin Brahmin must be noted for this self-elation. The discourse of a “superior Aryan” indigeneity, as opposed to non-Hindu and lower caste minorities who cannot use these claims, is likewise used against various minorities in North America. Hindu Nationalist websites and organizations in North America (such as the highly polemical Hindu Dharma Foundation in California) have been at the forefront of producing literature about India as “the Cradle of Civilization” and Hinduism as the original religion of upper caste Aryans. No wonder then that American Hindu Nationalists have chosen to severely condemn Indian historians like Romila Thapar, who challenge such racist upper-caste Hindu perceptions of their supposedly “pure” Aryan heritage. They describe her work as an endeavour to “discredit Hindu civilization.” Sociologist Judith Brown has noted that proclaiming an Aryan heritage is a means for Indian Americans to distinguish themselves from other immigrant groups by demonstrating their ancestral racial ties with Europeans. It is second generation children of these right-wing Hindu nationalists, however, who unfortunately find themselves in a precarious place. Indian-origin Hindu Canadian youths genuinely want to understand their histories and cultures. Former Political Scientist at Queen’s University Jayant Lele claims that the Hindu Right indoctrinates these diaspora children with distorted accounts of Indian history where Sikh, Muslims, Dalits and other minorities victimized upper caste Hindus. It is a comforting narrative for well-off Hindus, both in the homeland and in western countries such as Canada. The often indoctrinated and ignorant position of these children of Hindu immigrants makes it easy for them to be co-opted into right wing Hindu organizations in Canada as its cadres. It is, as sociologist Prema Kurien has observed, Sikh and Muslim minorities in India and Canada, besides Blacks and Indigenous peoples, who face persecution from White supremacists and their silent supporters. It is these groups who suffer most when one community of colour aligns in marginalizing other minority communities. Furthermore, the murder of an Indian engineer in Kansas by a white supremacist who mistook him and his Indian friend for Middle Easterners this year symbolizes the limits of diaspora Hindu Nationalist aspirations for acceptance into Whiteness. It speaks volumes about Singh that he refused to correct an Islamophobe at an event whose clip went viral, clearly adopting an egalitarian stance for all religious minorities against racism. Nonetheless, raising awareness and drawing the similarities between right wing Hindus and conservative quarters that want to protect white privilege is important at this hour, if we truly want to preserve “Canadian values” of anti-oppression. It is not Jagmeet Singh who has to answer questions, but factions such as Rise Canada who have to be held accountable for their hate politics. Sanober Umar is currently a PhD Candidate at the Department of History at Queen’s University. Her areas of expertize include Hindu Nationalism within and outside India, and its impact on non-Hindu minorities. She holds a MSc in Migration Studies from the University of Oxford (2013), a MIS/MA in International Studies (with specialization in International History and Politics) from the Graduate Institute of International Studies and Development, Geneva (2011), and a B.A (Hons. History) from St Stephen’s College, University of Delhi. Brown, Judith, Global South Asians: Introducing the Modern Diaspora, London: Cambridge, 2006. Jaffrelot, Christopher and Ingrid Therwath, “The Sangh Parivar and the Hindu Diaspora in the West: What kind of ‘Long Distance Nationalism’” International Political Sociology, Volume 1:3, September 2007. Lele, Jayant, “Indian Diaspora’s Long Distance Nationalism: The Rise and Proliferation of ‘Hindutva’ in Canada” in Sushma J. Verma and Radhika Seeshan ed. Fractured Identity: The Indian Diaspora in Canada, New Delhi: Rawat Publications, 2003. Kurien, Prema, “Multiculturalism, Immigrant Religion and Diasporic Nationalism: The Development of American Hinduism” in Social Problems, Vol 51: 3, 2004. Thapar, Romila,”The Theory of Aryan Race and India: History and Politics”, Social Scientist , Vol. 24, No. 1/3, pp. 3-29. See Romila Thapar, The Theory of Aryan Race and India: History and Politics, Social Scientist, Vol. 24, No. 1/3, pp. 3-29. 1996. See Judith Brown, Global South Asians: Introducing the Modern Diaspora, London: Cambridge, 2006. See Jayant Lele, “Indian Diaspora’s Long Distance Nationalism: The Rise and Proliferation of ‘Hindutva’ in Canada” in Sushma J. Verma and Radhika Seeshan ed. Fractured Identity: The Indian Diaspora in Canada, New Delhi: Rawat Publications, 2003. See Prema Kurien, “Multiculturalism, Immigrant Religion and Diasporic Nationalism: The Development of American Hinduism” in Social Problems, Vol 51: 3, 2004.